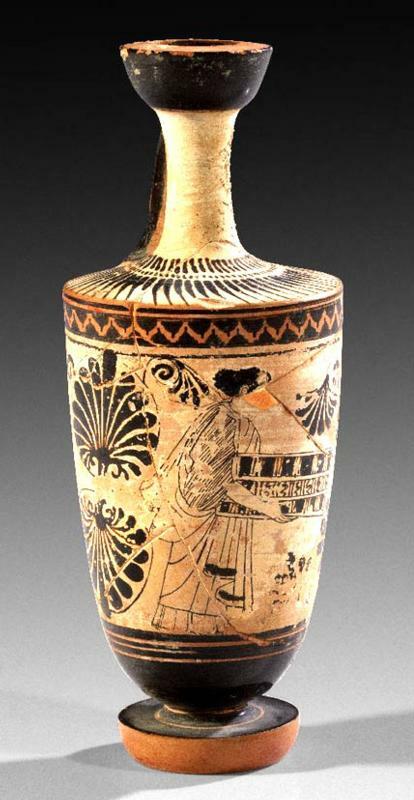 circa 470 - 450 BC B.C. On the body is a young woman with large cista between palmettes, above a frieze made of two lines of half pomegranates. Reassembled from large shards and with a little piece missing. Size 6-1/8 inches (15.8cm) H.
Published in the Beazley Archive (BAPD 9037161. With a copy of a letter in German from Erika Simon from 1987 describing the iconography and stating that the casket is considered a marriage gift. Provenance: Ex collection P.C., Southern Germany, acquired in 1989 by Herbert A. Cahn, Basel; before Holger Termer, Hamburg.